You can email me or contact me on 0406 397650. I forgot to photograph these cards but luckily I was able to photo a friend/customer's cards so I could show you. Thanks Sarah! This was a simple card to make - just using a few punches, embossing folder and ribbon! Oh and a couple of markers. I used my markers to colour in the flowers and my blender pen for the vase. 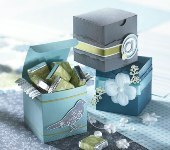 The stamp set is the Level 1 hostess set from the Idea Book & Catalogue, "A Slice Of Life". I seem to be favouring this set lately. This is the other card my ladies made. This card was cased from my upline Jayne Mercer. This is again a simple card. No layers - except for the sentiment!! lol. 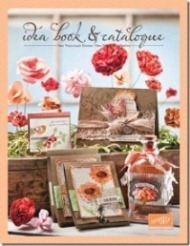 The stamp set used is "Just Believe" from the Idea Book & Catalogue. I have a couple of projects left to show you from the training day. Cute, isn't it?! The butterflies are from the 'Beautiful Butterflies' bigz dies and then embossed with the 'Petals-a-Plenty' textured embossing folder. A close up of the embossed butterflies with some shimmer paint. Here is the other project - a 6" x 6" scrapbook page. So, this month saw the last of my Stamp-a-Stack classes for the year. I have been busy making gifts for my ladies and I will show you them soon. We are heading to QLD next week for Oliver's birthday so I'm hoping to get some posts scheduled while we are away. This is one of the cards I made at the weekend away for my dad for Father's Day (1st Sunday in September). No matter how hard I tried, I just couldn't get a good photo - sorry. Last month saw the start of my Christmas Stamp-a-Stack classes. Here is the first card. I've used Kraft and Pacific Point cardstock. A bit non-traditional Christmas colours but I really like it. A close up of the sparkle and rhinestone brad. The same card but using traditional Christmas colours. I don't know if you can see in this picture, but I scored 1cm on either side (not the top or bottom). Here is a better photo to show you the scored lines. These cards are great if you have a lot to do. The longest part was the 2-step stamping with the flower stamp from Cottage Garden. I used the 5 petal flower punch to then punch them out instead of cutting them out (that was a time saver!!). You could get a bunch of these completed in a few hours. I think I might keep these as MY christmas cards to send out this year. These are the two cards I taught at this mont's SAS (stamp-a-stack) class. This card was inspired by my upline Jayne with her swap card from Convention. Jayne used 'bird on a branch' stamp set while I used the 'extra large 2-step bird punch' and ribbon. This card (apart from a couple of changes) came straight out of the Autumn/Winter Mini (pg 30). I really needed some inspiration for my class and what better place to look - the catalogues!!! The girls LOVED making these cards too. P.S. - I will be starting my Christmas SAS class next month, so if you would like to have christmas cards to send out to friends & family this year, come along to my class. I am soooooooo in love with the Manhattan Flower Embossing Folder! How gorgeous does this card look!? This is another make 'n take card made from the INKlings training day. Glossy card stock was used. An up close view of the flowers. Check out my official Stampin' Up! website. Click on picture to see Catalogue online. All content, including text, photographs and designs are © Kylie Swain unless otherwise noted. Some images are © 1990-2008 Stampin' Up! My designs are for inspiration only and not to be used for publication or submissions.